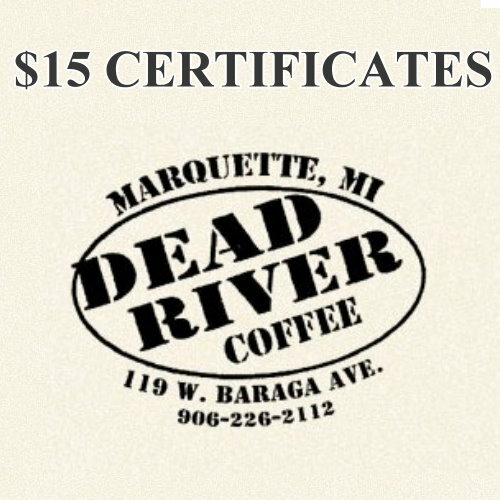 These $15 Dead River Coffee Certificates are good on anything in the shop! 1 certificate will cover 1 pound of most blends of coffee roasted in the shop! Stop into Dead River Coffee for "local color and a pretty good cup of coffee." Dead River Coffee custom roasts a wide selection of fine Arabica coffees brought from exotic locales with strange-sounding names, available by the cup or by the pound. Dead River Coffee serves homemade pie and other baked goods just the way Senora Maki made them for the boys in the lumber camps!